How many people click on a link inside your emails? How many people forward your emails? So, out of the people who actually received your email, your open rate is the percentage of people who opened that email. Companies with 1-10 employees and 26-200 employees: Open and Click rates are highest when 16-30 email campaigns are targeted per month. Companies with 1-10 employees typically receive a median open rate of 35.3% and a median click rate of 6.9% whereas companies with 26-200 employees receive a median open rate of 32.3% and a median click rate of 6.3%. 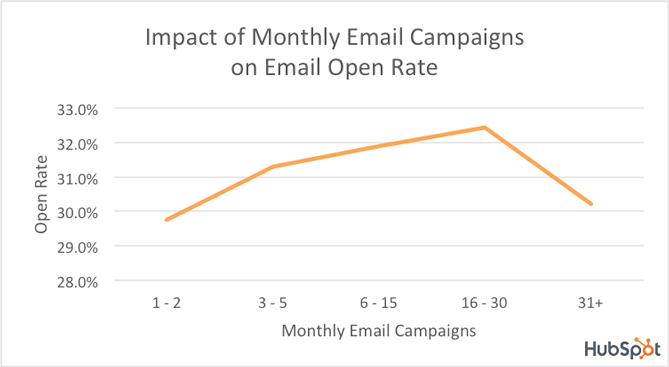 Companies with 11 – 25 employees: Open rates are highest when 31+ email campaigns are targeted per month. They have a median open rate of 32.4%. 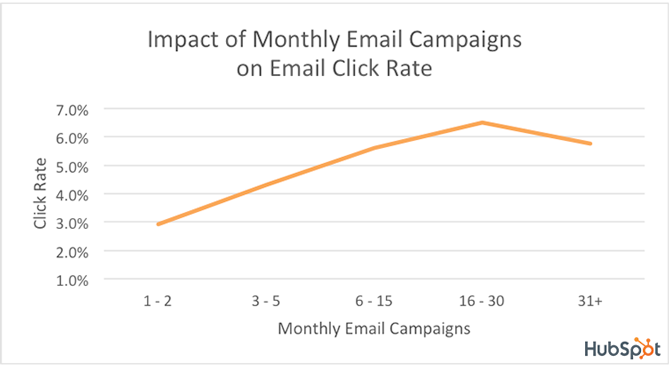 Yet, they get most clicks at 16-30 monthly email frequency with a median click of 6.7%. Companies over 201 employees:Highest median open rate of 32.2% was found in 3-5 email campaign frequency whereas the highest median click rate was found during 6-15 monthly email frequency.